Mera Peak climbing itinerary starts with a scenic mountain flight to Lukla and treks downwards for a while than ascends to Paiya. Mera peak climbing itinerary offers the beautiful Himalayan ranges of Everest, Makalu, and Jugal with Gauri Shanker. We make the best Mera peak climbing Itinerary with detail information for you. Mostly closer to the top of the Mera peak, you trek and use the rope for a short distance for Mera peak. 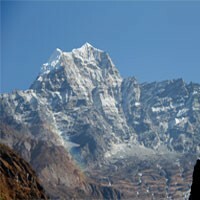 Remember us for Mera trek and climbing and have a great trekking and climbing experience of Nepal. Our airport representative will pick you up from Tribhuwan international airport Kathmandu by private transport and transfer to the Hotel. Overnight at Hotel. You will have full day Kathmandu city tour this day and will talk about the trip. You will visit four world heritage sites in Kathmandu with a knowledgeable guide by private transport. The sites you will visit are Kathmandu Durbar Square, Monkey Temple, Bauddhanath and Pashupatinath temple. Overnight at Hotel. Day 03 : Fly to Lukla(2885m.) and trek to Paiya(2730m.) 5-6 hrs. You will fly early morning to Lukla which takes about half an hour to get to Lukla and trek to Paiya. You will descend to Surki and climbing to Paiya this day. You will walk in the forest trail and cross some suspension bridges and see some white mountain along the trail. Overnight at guest house. Day 04 : Trek from Paiya to Pangkongma(2846m.) 5-6 hrs. You will descend for a while from here and reach a small bridge. From here the trail will be bit slippery. You will cross rhododendron and bamboo forest through mountain narrow forest. Crossing Kari-La pass, you will be Pangkongma this day. Overnight at guest house. Day 05 : Trek from Pangkongma to Nashing Dingma(2591m.) 4-5 hrs. After trekking out of Pangkongma, You will cross the Pangkongma La pass. Then trail ascends, walk on a steady path, pass a mani and reach Shibuche. You will have lunch here. Then continue the trek on a downhill path before crossing a bridge over the Hinku Khola. You will pass through Gai Kharka or a grazing area and reach Nashing Dinga after a while. Overnight at guest house. Day 06 : Trek from Nashing Dingma to Chhatra Khola(2800m.) 7-8 hrs. You will descend to Surki La pass and cross it and continue walking downhill for a while. Then the trail begins ascending. The trail then passes through Phokte Village, Chalem Kharka and Danda Kharka. We also pass through bamboo forests. After Danda Kharka, it is an uphill walk until you reach Panch Pokhari. You will walk on a zigzag path before reaching Chhatra Khola. Overnight at guest house. Day 07 : Trek from Chhatra Khola to Kothe(3691m.) 6-7 hrs. You will walk towards the north on the main trail to Mera Peak. After walking on a trail next to the Majang Khola, the trail merges with another trail which moves alongside the Hinku Khola. You will walk straight ahead towards Tashing Ongma which has seasonal tea shops and continue the trek and cross the bridge over the Sanu Khola before reaching Kothe. Overnight at guest house. Day 08 : Trek from Kothe to Thaknak(4358m.) 3-4 hrs. You will trek along the ridge of the Hinku Khola in the shadow of Mera Peak. You will have lunch at Gondishung, the summer herders' settlement in the west bank of the Hinku Drangka. Beyond Gondishung, You will pass a 200 years old Lungsumgba Gompa where You can find Mera Peak scripted in rock along with its route to reach Mera. A short walk takes You to Thaknak, which is a summer grazing area with primitive lodges and shops. Overnight at guest house. Day 09 : Trek from Thaknak to Khare(5045m.) 2-3 hrs. You will follow the lateral moraine of Dig Glacier to Dig Kharka, which offers spectacular views of Charpate Himal. The trail climbs through moraines to the snout of the Hinku Nup and Shar glaciers and then climbs more steeply to Khare. From here, You can see the northern face of Mera Peak which will be an amazing experience. After lunch, we can hike in and around Khare and you will have a climbing practice here. Overnight at guest house. Day 10 : Trek from Khare to Mera high camp(5780m.) 6-7 hrs. 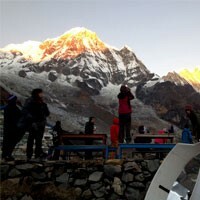 You will walk through a boulder-strewn course on a steep trail to reach the Mera Peak Base Camp. From here, You continue further through the Mera La pass to reach the Mera High Camp. The path is along a rocky trail, which can be difficult if it has recently snowed, as there are a number of crevasses. You will make your way to the top of the rock band, which is marked by a large cairn. Then set up a high camp while enjoying excellent views of Mt. Everest, Makalu, Cho Oyu, the south face of Lhotse, Nuptse, Chamlang and Baruntse. Overnight at tented camp. Day 11 : Summit to Mera peak(6461m.) and trek down to Khare. This is a really important day for climbing. You will wake up at around 2 in the morning for breakfast. It’s going to be very cold in the beginning but soon it will warm up as You start to walk to the glacier and onto a peculiar ridge. The first rays of the sun hit the big peaks in an amazing red glow. The route is still non-technical as we slowly climb higher into the ever-thinning air. The slope steepens for a section behind the ridge and the summit comes back into view. At the foot of the final steep summit cone, you may use a fixed rope if the climbing leader believes it’s required. The summit is only a few meters away. 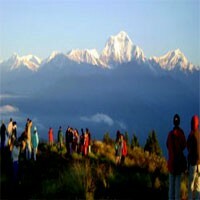 From the summit, you take in spectacular views of the mighty Himalayas including Mt. Everest (8,848m), Cho-Oyu (8,210m), Lhotse (8,516m), Makalu (8,463m), Kangchenjunga (8,586m), Nuptse (7,855m), Chamlang (7,319m), Baruntse (7, 129m) and others. Later, steps back to the high camp where you may rest for a while before descending to Khare. Overnight at the guest. Day 12 : Trek from Khare to Kothe(3691m.) 4-5 hrs. You will trek from Khare to Kothe along the same trail used previously. After reaching Kothe, you celebrate success by trying out local delicacies and wines. Overnight at guest house. Day 13 : Trek from Kothe to Zatrwa-La pass(4600m.) 6-7 hrs. You will walk on a trail next to the Inkhu Khola. After walking a little further away from Mosom Kharka, you will cross a bridge over the Inkhu Khola. Shortly, then cross another bridge over Sanu Khola. pass through Tashing Dingma and Thuli Kharka before reaching Zatrwa La pass. You spend the night near the pass. Overnight at guest house. Day 14 : Trek from Zatrwa-La to Lukla(2885m.) 6-7 hrs. You will cross the Zatrwa-La pass at 4,600. You are welcomed by the sight of the beautiful Lukla Valley which is surrounded by Cho Oyu, Kongde Peak, Numbur Himal, Kusum Khangru and other Himalayan peaks. From Zatrwa La pass, you walk all the way down to Chutanga and then straight forward to the Lukla village. This day you can celebrate the last night of the mountain. Overnight at guest house. Day 15 : Fly from Lukla to Kathmandu. You will catch an early morning flight to Kathmandu. After reaching Kathmandu, you can take a rest and Frolic Adventure invites farewell dinner to you this evening. Overnight at Hotel. Day 16 : Spare day in Kathmandu. You may do your souvenir shopping this day and walk around the city. Overnight at Hotel. Day 17 : Final departure to the international airport. Frolic Adventure provides private transport to the airport for your final departure.